How many top executives do you know who have made the committment and taken the time to follow a creative passion outside of the boardroom? Add Mr. Lynn Blodgett to that likely-short list. 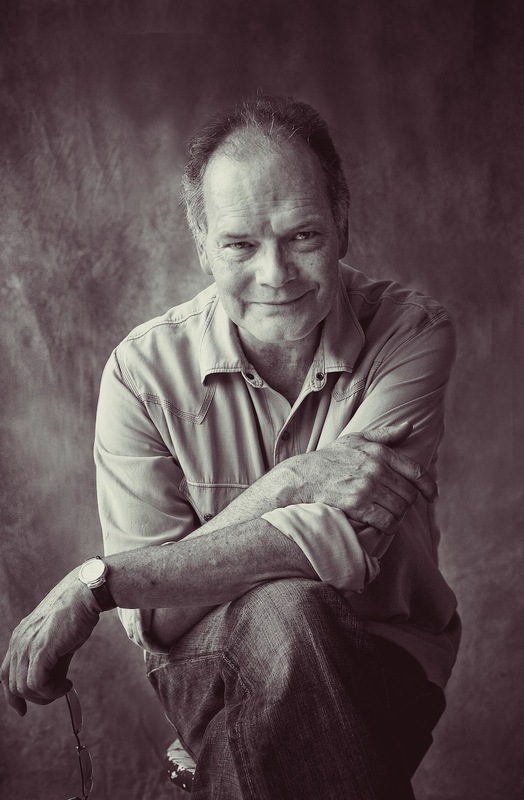 One of our clients, and a favorite of ours, Blodgett is using his creative [or left brain] talent again, this time in a photography exhibition at the Kimball Art Center in Park City, Utah. Those close to him use only the highest order of adjectives to describe Lynn: humble, brilliant, gentle, industrious, deeply passionate. We agree. Compliments aside, most recently, Blodgett has funneled those traits into Soldier Boy. Soldier Girl. – paying tribute to our nations’ veterans. 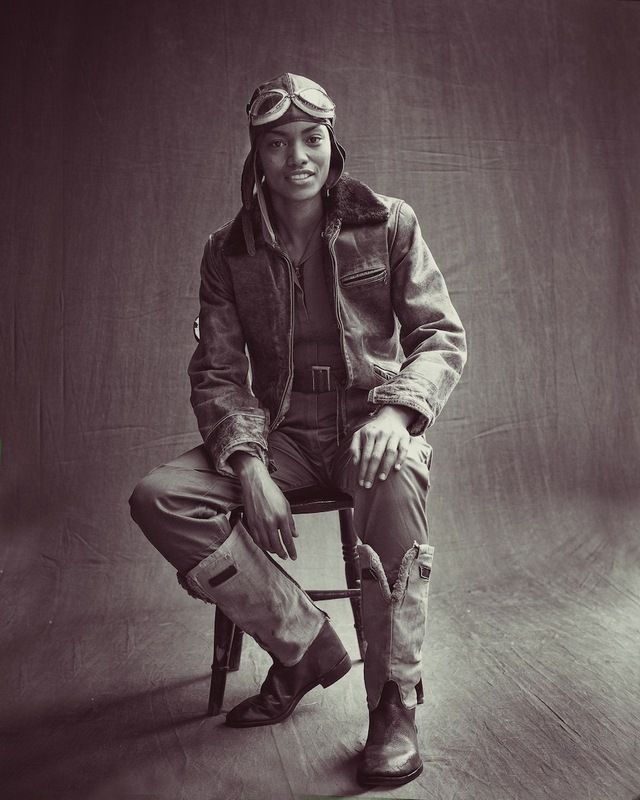 He has taken a unique approach, using one male and one female model in each image, dressed in the military uniforms of every war ever fought by the United States. We had a quick chat with Blodgett just before he dove into an important meeting for Xerox [you know, that corporate day job]. A few images below will give you an idea of what's in store. Read on to learn more, and meet him Friday evening in-person at the Kimball Art Center from 6:00 - 9:00pm. We’ll be there. How did the idea for Soldier Boy. Soldier Girl. come to be? Do you have personal connections to the military? It started when I was working on Finding Grace [COLLECTIVE note: this was Lynn's first major photography project/book that was published to raise money & awareness for the homeless]. While photographing the homeless, I was startled to see how many of my subjects were veterans. It just seemed so inappropriate to me –- many of the homeless are the people that put themselves at risk for our country. The goal of Finding Grace was to raise awareness of homelessness in a positive way. After working with homeless vets, I started thinking of what we could do to help raise awareness of them as well. Tell me about the process for this shoot. Where did you find the uniforms, etc.? I shot everything in our mobile studio using natural light. I used a 50 megapixel Hasselblad and a Canon 1-dX. We also used a cloth backdrop. The first task was to identify the right people. I didn't want the images to look too modeled, so I chose people that I thought would look great in front of the camera, but also very believable. 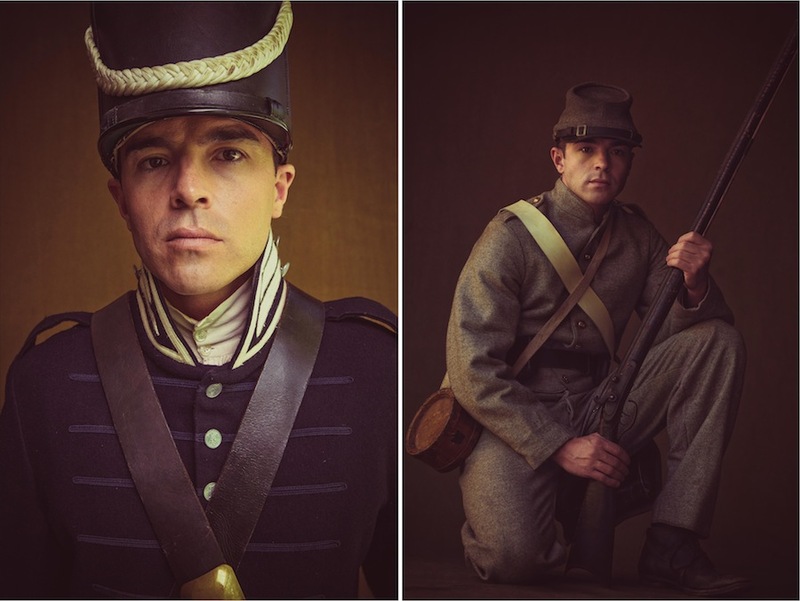 The first shoot we did was with Soldier Boy in World War I. For that uniform, I went on Ebay and found an original World War I uniform. It had all the original pieces, gas mask, hat, rifle etc. After that shoot, my photo editor advised me that we could go to one of the big costume houses in Hollywood, since they provides this type of clothing for the movies. That’s what I did. 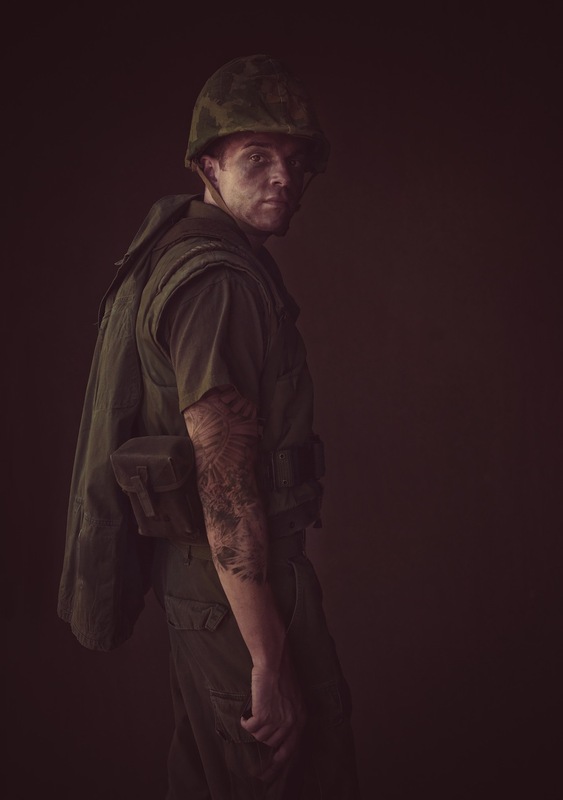 The costume company provided two to three different uniforms from each of the wars, so we would have different looks. The shoots themselves lasted one to two days, and we would typically do two to three wars per shoot. We completed the entire portfolio over the course of about two years. What will people see in this exhibition? 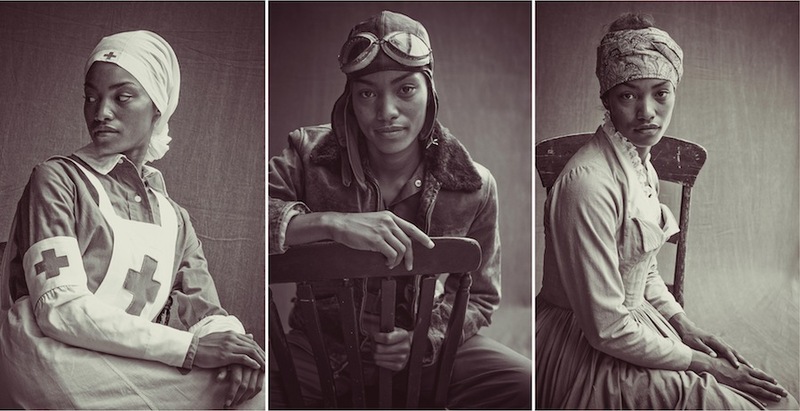 They will see individual images of two people, a man and a woman, in a true-to-life uniform from the 11 major conflicts since we declared our independence. Tell me about the framing you did and how you found and worked with the materials? I wanted to do something unique with the frames. I decided to go and find old army surplus materials that we could use as frame materials. We found military ammo boxes and gave some great metal fabricators the task of turning them into unique frames. They did an outstanding job! That was for soldier boy –- military green frames with original stencils on them. They harmonize well with the green color images of soldier boy. Soldier girl was shot in black and white, and we wanted a frame that would compliment those images. I had remembered that a U2 spy plane was black, and I wanted a similar look. Since we couldn't buy a used U2 spy plane and cut it up, I had the metal fabricators use aluminum and build a frame from a structure that looked like it was cut from an airplane wing. When and how did you make the transition from full-time executive to photographer, and what sparked that move for you? I'm still a full-time executive. I started doing photography more seriously many years ago as an outlet and a change from my corporate life. I've been able to maintain my activity in the corporate world and do photography in a way that was appropriate given my schedule.